Tangents was always going to be about, well, shooting off at strange tangents, so here goes. Now I keep saying the best book of the year is Jonathan Lethem’s Fortress of Solitude, and it is surely only right that possibly the only writer to mention the Go-Betweens in a best-selling novel gets to write the endorsement for a new edition of David Nichols’ book on the group? 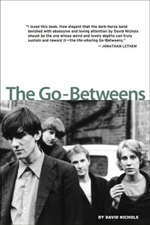 I was thinking I should have gone to see the Go-Betweens’ performance at the Barbican. 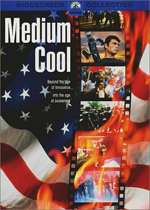 I was also thinking about how we have never really made much of the link between Robert Forster, the great Go-Between, and Robert Forster the actor, the star of one of my favourite films Medium Cool. Set in Chicago in 1968, and capturing those famously turbulent times, it really is a classic cinematic moment. I mentioned Jackie de Shannon’s lovely Jerry Wexler-produced song about Anna Karina recently, and I have read how much Haskell Wexler, the Medium Cool director, owed to Jean Luc Godard. Strangely yesterday the loveliest lady in the world bought me two books: Caetano Veloso’s Tropical Truth: A Story of Music & Revolution in Brazil, and Susan Sontag’s Against Interpretation and Other Essays. And even the most cursory glance at these documents of turbulent times reveals the debt these two great pop figures (and they are!) owe to Godard. Caetano explicitly states about the influence of Godard on the tropicalismo musical uprising in Brazil, and how he led him to pay attention to the poetry of American mass culture, to Hollywood, and to advertising. Interestingly Caetano also cites Edgar Morin, a French writer who linked Hollywood and comic book culture to art in a way that was art itself. I have long treasured a 1960-dog-eared paperback by Morin called The Stars, which I have stolen from mercilessly over the years. The whole pop art thing also underpins The Fortress of Solitude, with its emphasis on comic book culture (the Marvel comics which formed such a part of my miseducation) and pop (the lead characters are called Dylan and Mingus). I would also argue that the mix of pop culture and radical intellectualisation that fuelled the tropicalismo movement also fired up the Postcard Records cultural revolution in the early ‘80s. It may be insulting to put Postcard on a par with what people like Caetano Veloso and Victor Jara did with music, but for many it was really a personal revolution, a life changing time. And despite some bitchy comments from Postcard patron Alan Horne in the David Nichols book, the Go-Betweens really were an integral part of what happened then. Like Josef K, Orange Juice, and kindred spirits the Fire Engines, the Go-Betweens mixed the most overt elements of pop with the strangest strands of seductive and seditious philosophy. Postcard protagonists perhaps were criticised for being too knowing. Their art is splattered with specific references. So what? In Medium Cool there is an explicit reference to the Godard debt by displaying an A Bout De Souffle poster in Robert Forster’s room, just like the way the other Robert Forster will acknowledge his own songwriting debts to Guy Clark and Townes van Zandt in a song. The big Godard influence on the Postcard cultural revolution was old Vic. His adopted name was of course an acknowledgement of a debt, like the borrowing of the Verlaine name by one of his own heroes. It was also a reference to the times when Godard’s films, and other odd subtitled underground European movies, seemed to be late night BBC2 staples. Now how often do we get to see these films which so influenced the way Vic, Subway Sect, and others looked and acted and dreamt. And finally I’m sure it’s Love’s 'Emotions' that keeps cropping up so effectively and appropriately as the incidental theme in Medium Cool. I could be wrong. It’s the sort of thing you would imagine Dylan’s mum in The Fortress of Solitude knowing. And strangely, if you will permit me one more slight meandering off at a tangent, ever since I read how Lethem has her dressing her son in lovely Pro-Keds, our local TK Maxx has been practically trying to give pairs away. Not that I’m complaining! But it is a coincidence.